↑ Lefort's ally Marcus Louis lost his hair after Lefort ran away. 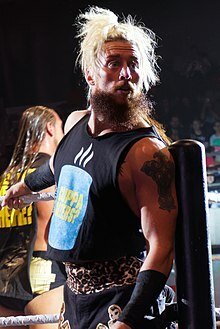 ↑ 1.0 1.1 1.2 1.3 "Enzo Amore profile". WWE. Archived from the original on December 23, 2017. สืบค้นเมื่อ April 18, 2018. ↑ 2.0 2.1 2.2 "Enzo Amore: Profile & Match Listing". profightdb. สืบค้นเมื่อ May 24, 2015. ↑ 3.0 3.1 Locicero, Anthony. "Where are they now? Former Waldwick football player Eric Arndt". North Jersey Media Group. Archived from the original on June 30, 2014. สืบค้นเมื่อ June 28, 2014. ↑ 4.0 4.1 Howell, Nolan. "Neville shocks, defies odds at NXT Takeover: Fatal 4 Way". Slam! Sports. Canadian Online Explorer. สืบค้นเมื่อ September 13, 2014. ↑ "WWE Cruiserweight Championship". WWE. สืบค้นเมื่อ September 24, 2017. หน้านี้แก้ไขล่าสุดเมื่อวันที่ 10 ตุลาคม 2561 เวลา 20:38 น.